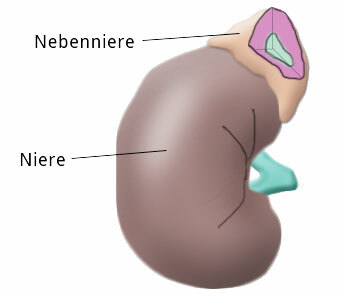 The adrenal glands are located at the cranial pole of the kidneys but otherwise have little in common with the kidneys. Anatomically the adrenal glands consist of the adrenal medulla and the adrenal cortex, which can be divided histologically into the Zona glomerulosa, Zona fasciculata, and Zona reticularis. In the Zona glomerulosa, mineralocorticoids like aldosterone are produced, in the Zona fasciculata glucocorticoids like cortisone and cortisol, and in the Zona reticularis androgens. The adrenal medulla is where adrenaline, noradrenaline, and dopamine are produced. Adrenal medulla hyperfunction is accompanied by overproduction and secretion of adrenaline and noradrenaline. This is often associated with arterial hypertonia, which is difficult to treat with drugs. Anxiety, irritability, elevated general metabolism, and general hypermetabolism are further symptoms. Pheochromocytoma can occur with familial clustering in connection with so-called multiple endocrine neoplasias, chiefly MEN II combined with medullary thyroid gland carcinoma and hyperparathyroidism. In the majority of cases pheochromocytoma is localized in the adrenal glands, in 10% to 15% of cases however they are located extrarenally. An adrenal manifestation does not automatically mean that the finding must be unilateral. 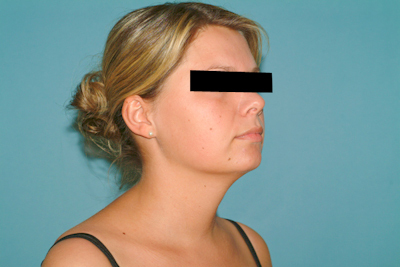 Bilateral involvement is found in about 5% of cases and suggests the presence of a MEN II. In addition to the patient’s medical history, which can offer important clues to the clinical picture, laboratory findings can play a decisive role in diagnosing a pheochromocytoma. In blood, adrenalin and noradrenaline are determined, in 24 h urine their by-products, metanephrine and vanillin-mandelic acid. Chromogranin A and dopamine and elevated calcitonin can indicate the presence of a MEN. Pheochromocytoma can be localized by computed tomography or magnetic resonance tomography (MRT) of the abdomen. Selective blood sampling can also help to clarify a questionable lateral location. Scintigraphy with methyl-123-iodine-benzyl-guanidine (MIBG) is highly specific for the presence of pheochromocytoma. Diagnosis of pheochromocytoma is an indication for surgery. In pheochromocytoma there is a risk that intraoperative manipulation will cause the release of large amounts of catecholamines, triggering a hypertensive crisis. This can be avoided by careful dissection. It is important, however, that the patient receives pretreatment with alpha and beta blockers. This pretreatment extends over a period of 10 to 14 days and prevents excessive secretion of adrenaline and noradrenaline during surgery. Transabdominal or retroperitoneal access via flank incision are used. The adrenals can also be easily reached by laparoscopy. Thus operation with minimal surgical trauma is possible. Overproduction of glucocorticoids indicates a Cushing’s syndrome or hypercortisolism. The cause lies in the adrenal cortex (adrenal Cushing’s) or in the pituitary gland (pituitary Cushing’s). These forms can be better distinguished by the influence of adrenocorticotropic hormone (ACTH). Excessive ACTH production in the pituitary, e.g. due to a pituitary adenoma, leads to excessive stimulation of the adrenal glands, termed an ACTH-caused or secondary form of Cushing’s. If ACTH is not involved, the cause lies in the adrenal cortex. This can be an adenoma or carcinoma, and is called the ACTH-independent or primary form of Cushing’s. Among the differential diagnostic possibilities is Cushingoid, which is caused by the Cushing’s threshold being exceeded due to exogenous glucocorticoid intake. 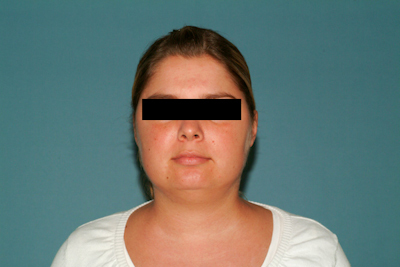 Patients with Cushing’s syndrome report rapid weight gain and exhibit typical morphological changes. 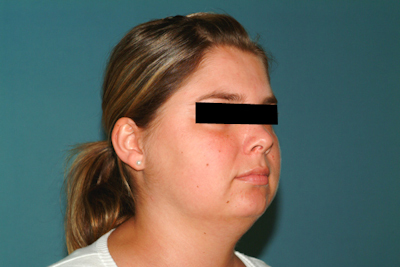 These include so-called moon face, truncal obesity, buffalo hump , and a typical white-red striae distensae rubra. Arterial hypertonia is not uncommon. 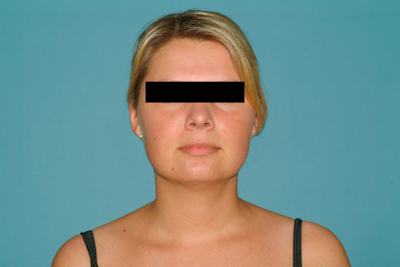 Conspicuous laboratory findings are elevated plasma cortisone and, sometimes, ACTH levels. The dexamethasone suppression test is used to distinguish between the primary and secondary forms of Cushing‘s syndrome. Localization is done by CT and MRT, sometimes with bilateral blood sampling and hormone determination. Osteoporosis and libido or potency problems also occur. Some women exhibit hirsutism and have menstrual cycle disturbances or amenorrhea. In the primary form of Cushing’s syndrome with adrenal gland adenoma, the adenoma is removed laparoscopically, either with transabdominal or retroperitoneal access. If a pituitary adenoma is present in the pituitary form of Cushing’s, it is removed surgically. Since the pituitary gland is located in the sella turcica, the operation can be performed transnasally. Primary hyperaldosteronism (Conn‘s syndrome) is triggered by hyperplasia of the adrenal gland cortex, to be precise, hyperplasia of the Zona glomerulosa. In about 30% of cases it is caused by an adrenal gland adenoma. Here too there are extrarenal forms, a reninoma or renal artery stenosis, which sometimes trigger a secondary Conn’s syndrome. Diagnostic hallmarks are arterial hypertonia and the simultaneous presence of hypokalemia and hypernatremia. In laboratory diagnostics aldosterone can be demonstrated in blood and in 24-h urine. Renin is lowered in the primary form of hyperaldosteronism, in the secondary form it is elevated. For localization, MRT is best, and bilateral selective blood sampling. Diagnostisch wegweisend sind eine arterielle Hypertonie sowie das gleichzeitige Vorliegen einer Hypokaliämie und Hypernatriämie. In der erweiterten Labordiagnostik lässt sich Aldosteron im Blut und auch im 24-h-Sammelurin nachweisen. Das Renin ist bei der primären Form des Hyperaldosteronismus erniedrigt, bei der sekundären Form erhöht. Zur Klärung der Seitenlokalisation eignet sich am ehesten die MRT und die seitengetrennte Blutentnahme. Die Therapie besteht aus einer konservativen Behandlung mit einem Aldosteron-Antagonisten wie Spironolacton, eine Indikation zur Operation ergibt sich bei Vorliegen eines Adenoms oder bei Verdacht auf eine Nebennierenkarzinom. The term incidentaloma derives from the fact that this hormone-inactive adrenal gland tumor is usually an incidental finding of renal sonography. The term encompasses both benign and malignant tumors, which in adults chiefly arise in the adrenal cortex. In addition to exclusion of hormone activity, diagnosis focuses mainly on localization, which can be achieved by CT or contrast medium-intensified MRT. The indication for surgery depends primarily on tumor size. Incidentalomas up to 3 cm in size are monitored every 6 months, those exceeding 5 cm are suspicious for adrenal carcinoma. If an adrenal gland carcinoma is confirmed during surgery, the paraaortic and paracaval lymph nodes are resected, adjuvant chemotherapy given, and the tumor bed irradiated.